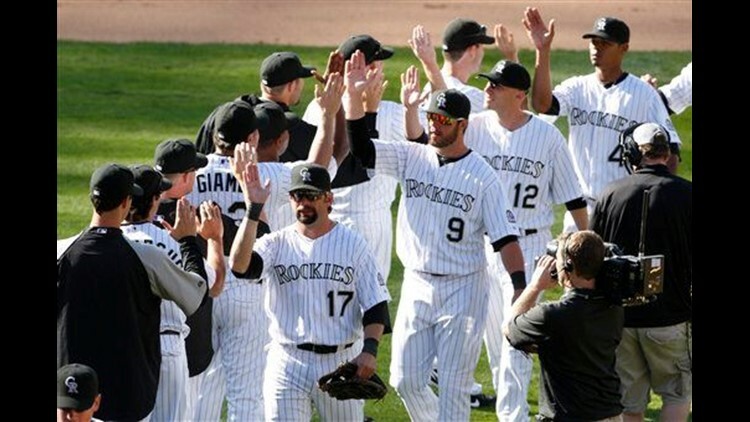 DENVER (AP) - Jorge De La Rosa pitched seven innings of one-hit ball, and Clint Barmes hit a late three-run homer to lead the Colorado Rockies over the San Diego Padres 7-0 Friday in their home opener. Ian Stewart drove in two runs, and Todd Helton and Miguel Olivo each added run-scoring singles to help the Rockies stop a two-game skid. De La Rosa (1-0) kept the Padres off balance with a fastball that consistently reached 94 mph. The lefty struck out nine and enticed San Diego to roll into 10 groundball outs. Rafael Betancourt pitched a scoreless eighth - giving up just the second hit of the game - and Esmil Rogers finished.